Ceremonies mark life. Many come with a birth of a child, a union of a couple or upon death. For the Sherpa, they will not climb Everest without one such ceremony, a Puja. But first, the news. Team after team is arriving at EBC while the roads are crowded in Tibet with Land Rovers ferrying climbers to CBC. For a complete update see the Tracker Table. There are reports of Wifi access at EBC being expensive, slow and unreliable . Not sure how to read this as the definition of “expensive” varies by individual – slow and unreliable is pretty clear . Access to WiFi has become standard for all teams on Everest. All are hoping EverestLink will be up on the Nepal side and ChinaTelecom functional on the Tibet side. In 2017 at EBC it was a reasonable price of US$50 for 500 MB. Last autumn when I climbed Island Peak, it cost 600 Nepalese Rupees for 1GB. The exchange rate is about $1=1 Nepal Rupee RS. However, the pricing changes for access at EBC – a captive audience with no competition. I have not heard what the current price is but considering where you are, having instant access to high speed internet is pretty amazing. By the way, the signal does not go above base camp so satellite phones are still the most reliable way of communicating back home while up high. The mobile phone provide, NCELL, does provide a signal from their antennas at Gorak Shep, but you have to wander around EBC to find a reliable 3G signal; a voice connection is a bit easier to find. If anyone at EBC can send me an update on prices and NCELL connectivity, I’ll pass it on. Thanks! Alpenglow this year is 11 foreign summit members and 4 foreign AMGA/IFMGA guides, along with 18 Nepali summit Sherpa (HAW). Also of course Cory/Topo on their new route. And 4 N Col members. Our first 13 team members are in Lhasa today, heading to shigatse tomorrow. The 7 Rapid Ascent members arrive Lhasa April 22, and our 1 Lightning Ascent member will come on after we confirm a summit window, sometime in May. Our rapid ascent team (35days) is our team for “normal” people. Our experience requirements might be higher than some other companies, but this is for safety and my feeling of what’s “right”. Our climbers are normal people with normal jobs (pilot, lawyer, realtor, skier, engineer, nutritionist). Over 7 years of doing Rapid Ascent, I am 100% confident it is easier on the average client than a traditional ascent. So yep, normal! We sherpa people have a strong belief that each and every mountains abodes realm of gods and goddesses. Like always, we had our puja ceremony on 7th April with prayers, offerings, sherpa dances and respect wishing for a safe and successful season. The last two days at base camp have been busy, for doing nothing! Up at sunrise, around 7 and to breakfast at 8 then back to your tent for, well you really don’t know. Then a walk around your camp, perhaps a visit to another camp or a quest for EverestLink cards. Now its time for lunch that turns into a three hour event as you debate world politics with every other nationality present. Back to your tent for a nap, then up for dinner. Your guide has joined the group. He serves as master of ceremonies to show movies each night after dinner from a laptop to a tiny LCD projector onto a big white sheet hung at the end of your grandmother’s table. The selection is impressive. Every climbing movie ever made, including the classics like The Eiger Sanction and Vertical Limit ( 🙄 ) but also the latest Academy Awards nominees and some you have never heard of, all courtesy of sourceforge or moviestorm … not that you know anything about this. But just before showtime, one of your guides gets everyone attention. “Hey, tomorrow is our Puja. Bring your harness, crampons, ice axes and anything sharp to the ceremony.” You know about Pujas but bringing anything sharp is new. Now your interest is raised. You watch Mission: Impossible 2 starring Tom Cruise and think he is looks old but loved his iron cross pose in the beginning … You leave half way through this flick. Your tent, the one in the middle of a row of seven, seems to catch the first rays of the sun. This is good as it warms your cocoon quickly. Then you remember, “It’s Puja morning.” You grab your “sharps”, boots – anything that will touch the ground, touch Sagarmatha, touch Chomolungma. You head to breakfast. Its quick this morning as the Sherpas have been preparing for hours. The Lama spent most for the night cooking tiny pastries that will adorn the Alter. The Lama hiked in from a village to perform the ceremony. He does this for your team and for many others. He gets several thousand rupees for all of these – not a bad gig if you can get it. But cynicism aside, his demeanor, tone and reverence gives you pause half way through the ceremony. The Sherpas seem to have a high level of energy this morning. They move in a quickened pace that you rarely witness. A large stone Stupa has already been erected primarily to hold the flag pole and to hold a picture of the Dali Lama. Blankets are laid out for the climbers to sit on during the long ceremony. The Sherpas are busy stringing the mulit-color prayer flags across the camp, all centered on the flag pole at the Stupa. Soon the sounds of the fluttering flags cover the entire camp. Each flag has different meaning: yellow-earth, green water, red-fire, white-air, blue-space. More Sherpas are busy starting a small juniper fire. The smoke will cover the entire camp. It is hazy and fragrant. It marks the beginning of something special. This is not the last time you will see this smoke. Every time before leaving Base Camp, each climber and Sherpa will pass by this same spot, letting the smoke from the juniper boughs cover them. More on this later. Everyone takes their place on the blankets after resting their climbing tools against the Stupa. Part of the ceremony is to ask forgiveness for hurting Chomolungma with the sharp points of the tools. But the most important part is to ask permission to climb the mountain and for safe passage. “Forgiveness, permission and safety” you think these are qualities we should express everyday. The Lama begins with a low chant as he reads from the 300 year-old Tibetan prayer book. Everyone soon quiets down as the chanting occupies the entire team of Sherpas. Soon, a Sherpa laughs, others smile, the environment is respectful but not overly serious. 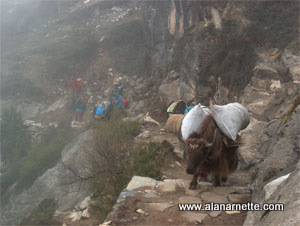 One Sherpa begins to walk around offering snacks and chiang to everyone. You shake your head, not wanting to drink any alcohol. It’s OK not to drink the fire water. The Sherpa just smile and move on. Everyone is now relaxed as the Lama continues his chanting. A small black bird lands on the top of the flag pole, a Himalaya Chuff, it is a sign of good luck. Everyone smiles. Without notice, the Lama and Sherpas performing the ceremony stand up. Another low baritone sound emerges. It rises and lowers, rise and lowers then on a mysterious signal, everyone takes their handful of rice and throws it into the air three times, saying another mysterious chant. You have no clue, but it doesn’t matter. Now everyone joins in doing their best imitation of a Tibetan chant. Listening carefully, you think the Tibetan ancestors would be pleased. Thinking the Puja is over now that rice has been thrown in the air (actually it was to ward off evil spirits) , the puja moves to next chapter. The Lama stops his chanting. Everyone stands up and begins to wander. But there is a system to this ceremony you simply don’t understand. All of a sudden there is a commotion all around as a Sherpa with a handful of brown powered, barley flour, spreads it all over your face. You really are confused but take it as a good thing as laughter abounds. It symbolizes a white beard and long life. Soon everyone is smearing flour, barley, on oneother. Then something occurs you might never understand. One of the senior Sherpas open the bottle of Jonnie Walker. He pours ever so much whisky into the cap and offers it one of your teammates. He gingerly takes the cap and drinks. The Sherpa repeats this two more times. But as you saw the Sherpas do it, before they drink, they put one finger into the cap, barley dabbing their finger tip and then throwing it over their left shoulder three times. It’s a mystery. More laughing and then the dancing starts. The Sherpas with arms around one another form a line and begin a dance that would make the Rockets proud. The climbers and trekkers join in. Another Sherpa walks around with the bottle of whisky, carefully pouring a small amount in the bottle cap, most everyone has a taste. More laughs and smiles. The ceremony ends with a whimper as people drift away, deep in their own thoughts as to what the ceremony meant to them. You return to your tent, emotions fully engaged. Clearly for the Sherpas is is homage to Miyolangsangma, the Tibetan Goddess of Mountains, who lives on the summit of Everest. For others it was a simple ceremony that symbolized the beginning of the climb. And for others it was entertainment, dismissing the beliefs of others. You slowly let the ceremony seep into. The sounds, the visions, the seriousness the Sherpas took in placing the prayer flags, building the Alter, placing the articles. The sound of the Lama reciting the Buddhist prayers, and the simple quiet between the moments. No, you didn’t drink the Johnny Walker. No you turned your head when the Sampa was offered as an indication of long life. And yes, you felt the connection between what many consider commercialization and the reason so many people are here to climb to climb Chomolungma. Perhaps your true reason on your “why” is revealed. And yet, you retreat to the simple answers given before you left home, the reason you told yourself. And the veneer is slow pealing away. 1 Nepal Rupie is about 0.009 US$. So 600 Rupies are about 5.40 US$ for 1 GB.